Over the last week a wave of immediate terminations has swept across towns and cities as far apart as Leicester, Sheffield and Glasgow. Couriers have reported that they and their colleagues have received identical emails accusing them of fraudulent activity and immediately terminating their agreement to deliver with the popular food delivery company. The extent of this cull of couriers extends to well over 100 at time of publication, and the couriers themselves – who vehemently deny the accusation of any wrong-doing – are left in the dark just days before Christmas with no work or way of appeal against these claims. To date, no evidence or facts to back up Deliveroo’s claims have been provided. The scale and spurious basis of the terminations have been condemned by the IWW Couriers Network, who are demanding that Deliveroo immediately reinstate all affected riders. The union further insists that should any evidence of fraudulent activity be in existence that this be confirmed and produced in each and every case to ensure that no innocent couriers have their agreement terminated. The Union further states that should these couriers not be reinstated with full apology, that it will have to consider taking further action to draw attention to Deliveroos appealing treatment of its workers. 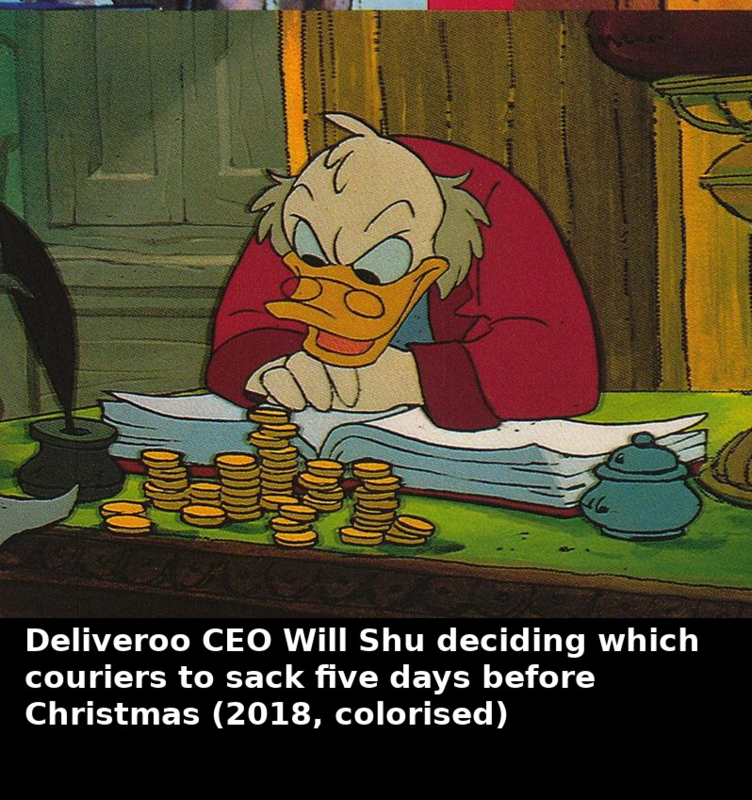 We’ve all heard the gig-economy referred to as Dickensian, but Will Shu of Deliveroo’s Scrooge impression really takes the biscuit.